The administration of a major Swiss city plans to migrate over 2m electronically archived files into a new document management system (DMS). The main challenge is to correctly match the meta data of each and every file of the existing archive with the corresponding file of the new DMS to ensure that the files will still be detectable after the migration. The migration is executed in a productive system: a system freeze is not possible, hence documents can be created, changed or deleted during the whole period of the migration. Each and every automated indexing of the migrated fields in the DMS must be reconciled with the meta data of the data source. OMrun starts and monitors the migration and checks the results in the new DMS fully automated. 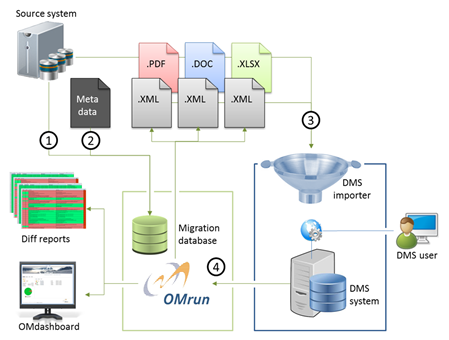 At first, OMrun gathers the extensive meta data of all documents from the source system and imports them into the internal migration data base . At the same time, all files to be migrated from the source system are being checked with the meta data in order to identify potential differences as early as possible . In addition to that, XML files of all files to be migrated are created and handed over to the DMS importer joint with the matching documents . After the autonomous DMS importer has processed all XML files, acknowledgment messages (ok / nok) of the import process can be collected and interpreted. After checking the meta data of the source system with the acknowledgment messages of the new DMS, reviewing the success of the migration is a no-brainer. Exactly the same procedure can be applied for checking the document indexes within DMS: meta data and acknowledgment messages will prove the migration success . To use both the maximum functional range of the DMS and also the optimized performance it is beneficial to use the API (application programming interface) of the DMS. But for any number of reasons it may ocur that the usage of the API is not favored. This procedure will be repeated arbitrarily in order to ensure the complete migration of all documents until the switch-off of the old system. It is made transparent on OMdashboard at any time which documents are already migrated successfully or how many times they have been updated by a newer active dokument version. The result of these data checks is a detailed report of the differences and rule violations respectively. These so-called diff reports are a valuable and easy-to-access baseline to supervise and adjust the migration process. Permanent transparency on data quality and data integrity turn critical migration projects into easy-to-monitor projects with a superior success rate.